i b i k e l o n d o n: 5 top tips to survive this Saturday's Big Ride! 5 top tips to survive this Saturday's Big Ride! 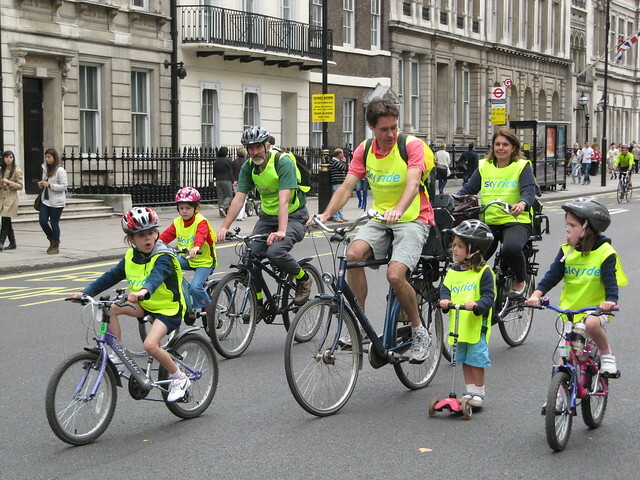 Bikes of all shapes and sizes will be taking to the streets of London this Saturday as thousands participate in the London Cycling Campaign's "Big Ride"
The fully marshaled family-friendly ride will take place on safe traffic-free streets through central London, passing some of its most famous landmarks and the seat of Government in Westminster. Whilst a day of fun is promised and a carnival atmosphere is sure to ensue, the ride carries a serious message to our politicians: just three days before we elect a new Mayor of London participants will be calling for our streets to be made as safe for cycling as they are in Holland. The ride is the culmination of the LCC's Love London, Go Dutch campaign; over 30,000 people have signed their petition calling for safer streets for cycling. LCC Chief Executive, Ashok Sinha, explains; "The Big Ride is our best chance to show the next mayor we're serious about redesigning our streets to make them safer for everyone. "Some of the mayoral manifestos show very weak commitments to cycling, so every person who comes to the Big Ride can help push safer cycling up the next mayoral agenda. "Please come and bring your friends and family to this fabulous day out with a purpose." So just how do you survive a bike ride through central London with thousands of other people on bikes? 1. Grab your family and friends! 2. Prepare for all meteorological eventualities! This is London, in spring, which means anything could happen. You'll need to pack for all weathers: I'm thinking sun cream and rain coats, umbrellas and shades. In all seriousness, do check the weather before you depart and be sure to bring lots of layers with you; you might get quite warm riding to the event, but there may be a bit of waiting round in the open air at the start and finish of the event where you are likely to cool down very quickly. Make sure you have plenty of clothes with you to keep your kids warm too. If you're wondering how you're going to carry all this stuff, that's what the funny shaped rack on the back of your bike is for. Haven't got a rack? Talk to someone who has. "Well hello Mrs Whittaker!" A hungry cyclist is an unhappy cyclist. A hungry child cyclist is even worse. Fuel up before you go; think energy food and longevity:porridge, bananas, a tin of treacle and a straw, that sort of thing. And of course be sure to bring lots and lots of food with you - if you haven't ridden for a while you'll be surprised how hungry it makes you. Besides, parking up a whole family of bicycles in central London whilst you and several thousand other cyclists "pop in" to Tesco Metro Westminster is right proper faff. If you're daunted by the prospect of cycling to and from the ride with your kids, don't be! Did you know you can take bikes on sections of the Underground and all of the London Overground? Better still, there are over 40 "feeder rides" from all corners of London staffed by London Cycling Campaign volunteers who will help you safely get you to and from the ride. Feeder rides are great; there's nothing like strength in numbers and the experience of riding in a big group together. Here's the list of feeder rides and a map. Plan ahead - you don't want to risk the shame of turning up with your bike in the back of an Addison Lee cab. All the information you need to know but were too afraid to ask is over on the London Cycling Campaign's website. Get dressed up in the campaign colours of red and white or decorate your bike and there might be a new Brompton in it for you! On a more serious note, Saturday's ride is the culmination of a year of protests in London - thousands took to the streets over the Battle for Blackfriars and over 2000 cycled through the February rain to Parliament on the eve of their cycle safety debate. Saturday's ride will be the biggest yet; tens of thousands are expected to attend. The date is historic too - it's Queen's Day, the national holiday of the Netherlands. Whilst the Dutch will no doubt be celebrating their own cycling good fortune the rest of Europe will be calling for streets as safe as theirs too. As well as The Big Ride in London on Saturday rides will also simultaneously take place in Edinburgh, Paris and Rome. Cycling is having its Stonewall Inn moment - but we all need to roll up our sleeves, get involved and be there if we want politicians to listen. I'll be there on Saturday, I hope you will join me!